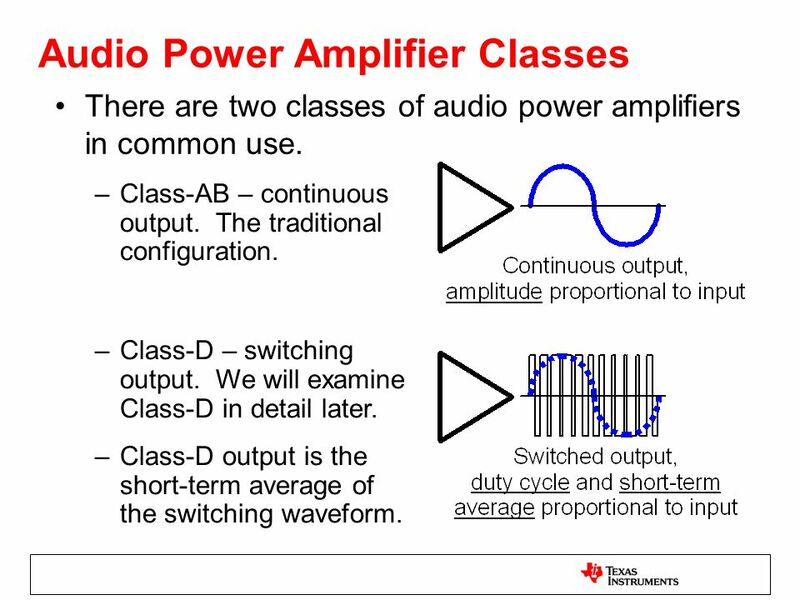 There are two classes of audio power amplifiers in common use. 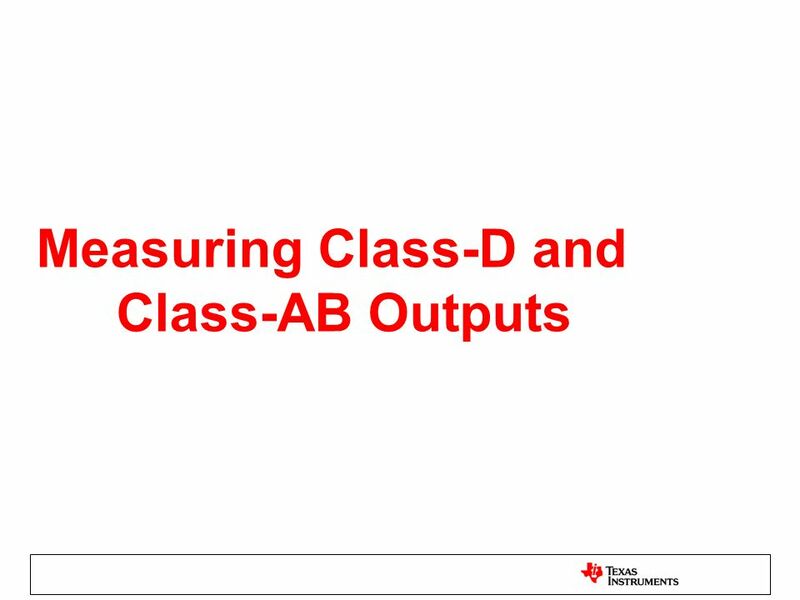 Class-AB – continuous output. The traditional configuration. 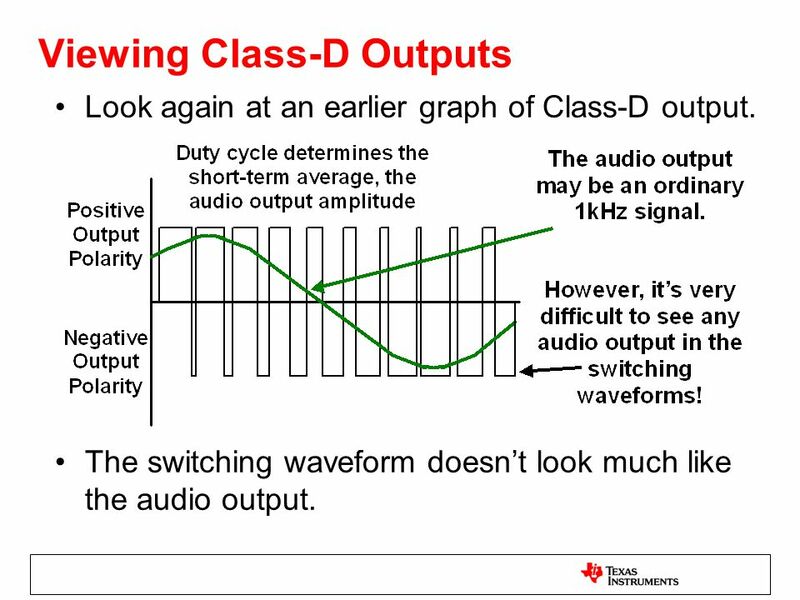 Class-D – switching output. We will examine Class-D in detail later. 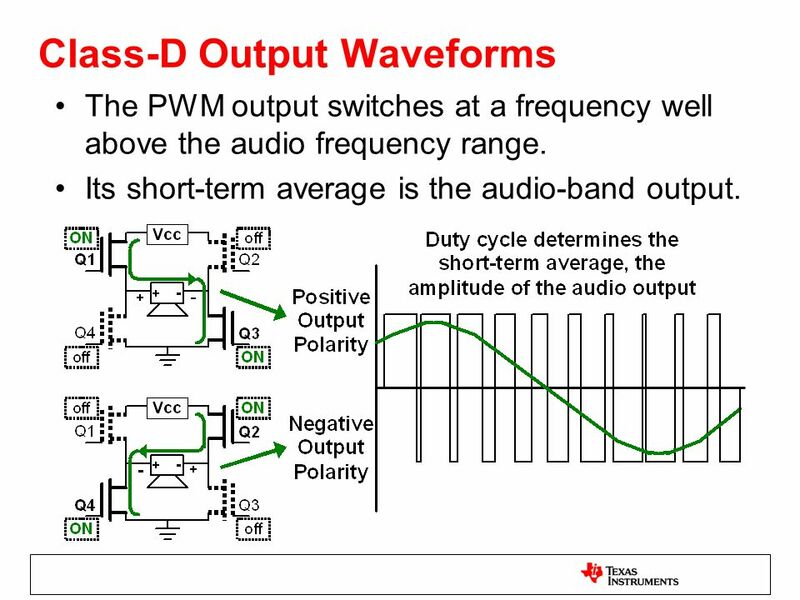 Class-D output is the short-term average of the switching waveform. Advantages and disadvantages of Class-AB. Simple application. Inexpensive (but not necessarily in SYSTEM cost). Low efficiency, high power drain and heat generation. 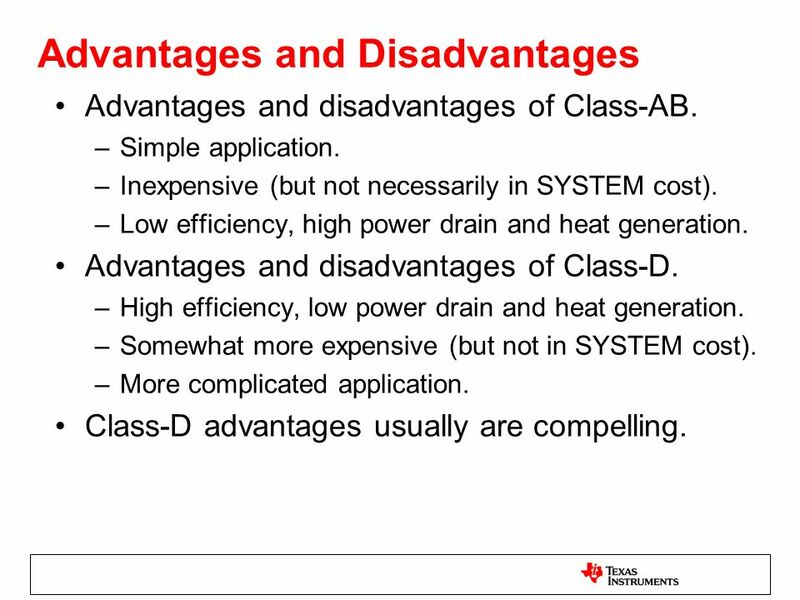 Advantages and disadvantages of Class-D. High efficiency, low power drain and heat generation. Somewhat more expensive (but not in SYSTEM cost). More complicated application. Class-D advantages usually are compelling. There are two common input configurations. Single-ended – single input line referred to ground. Traditional configuration. Differential – a pair of input lines. A superior configuration. May be connected to a differential source OR a single-ended source. 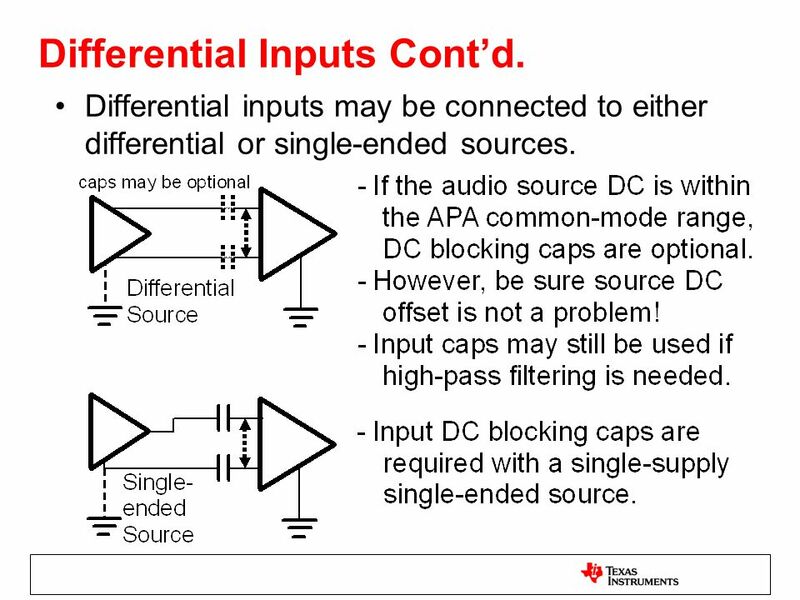 Input DC blocking cap are practically always required in single-supply systems. No rejection of input noise or interference. Input blocking caps may not be required. 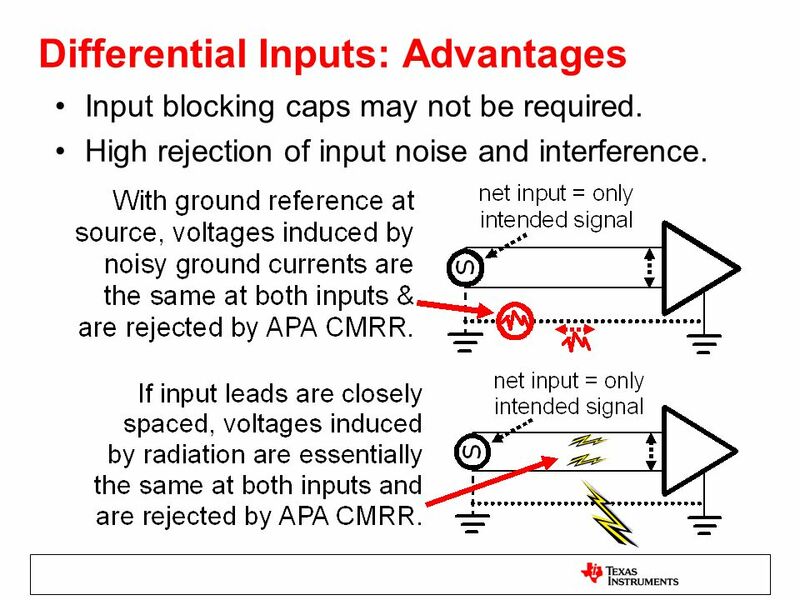 High rejection of input noise and interference. Differential inputs may be connected to either differential or single-ended sources. 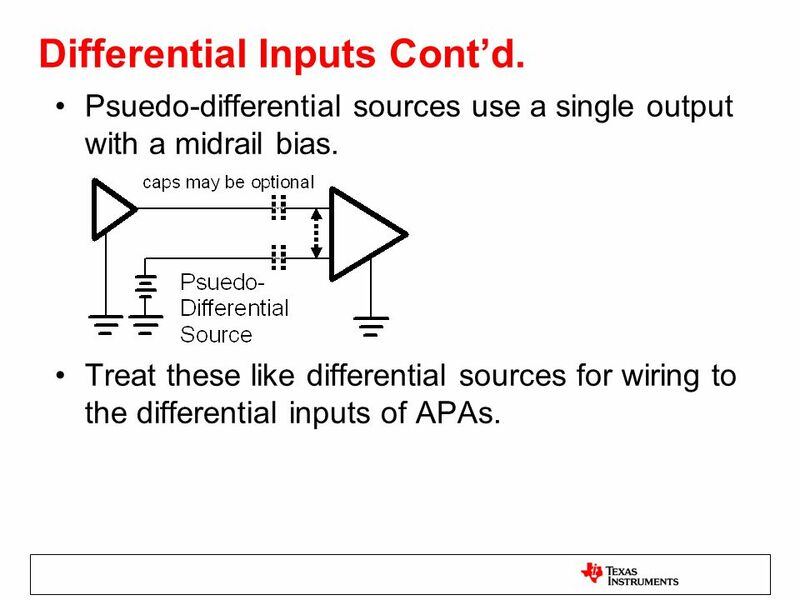 Psuedo-differential sources use a single output with a midrail bias. Treat these like differential sources for wiring to the differential inputs of APAs. Keep the 2 input leads close together. 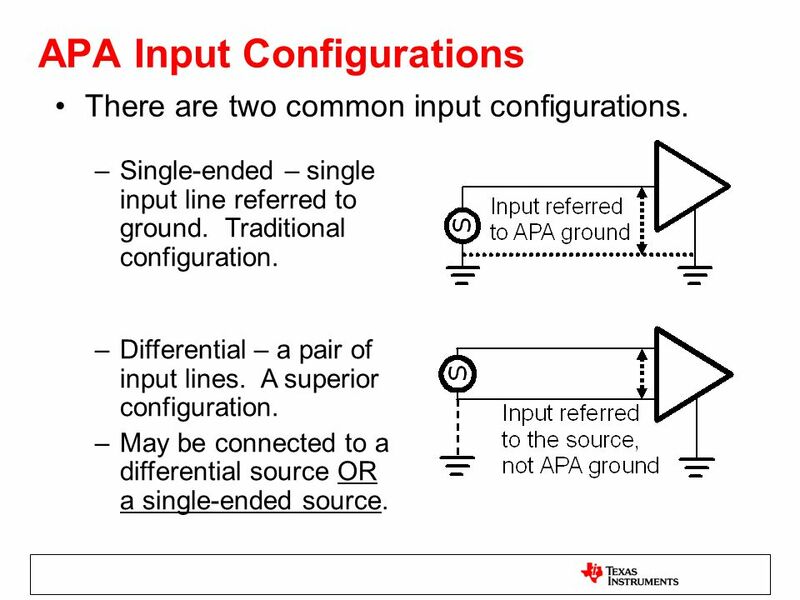 With single-ended sources connect the APA input ground lead at source ground, NOT at APA ground. 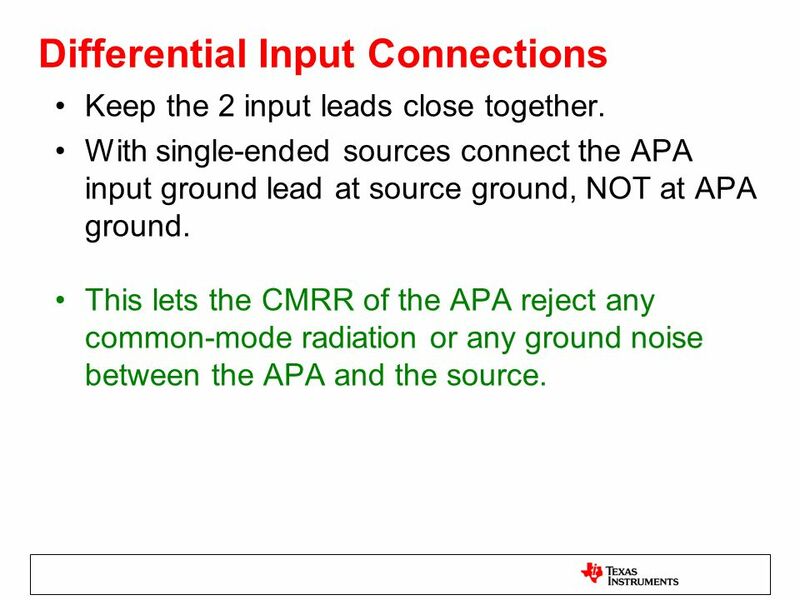 This lets the CMRR of the APA reject any common-mode radiation or any ground noise between the APA and the source. There are two common output configurations. Single-ended – single output line. Traditional configuration. Differential – a pair of output lines. Also called BTL (for Bridge-Tied Load). Must be connected to a floating load. 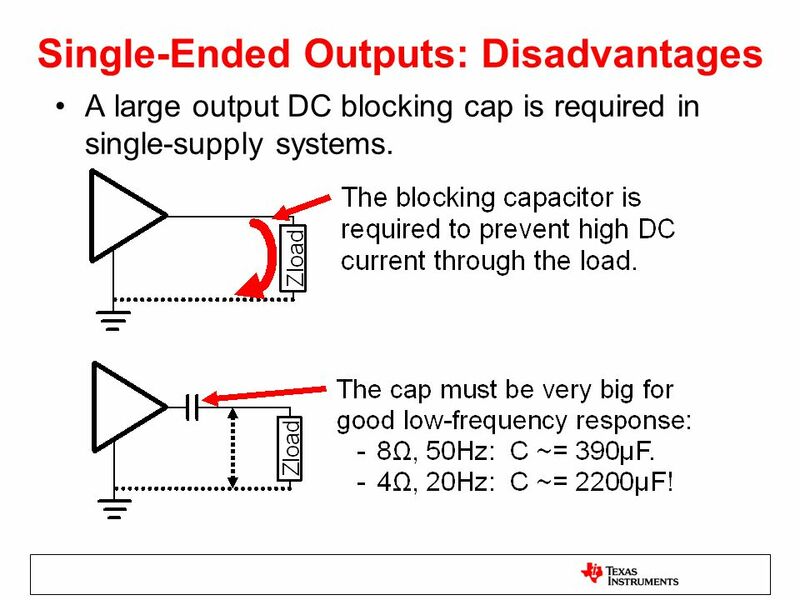 A large output DC blocking cap is required in single-supply systems. Output power is nearly 4 times S/E output power. 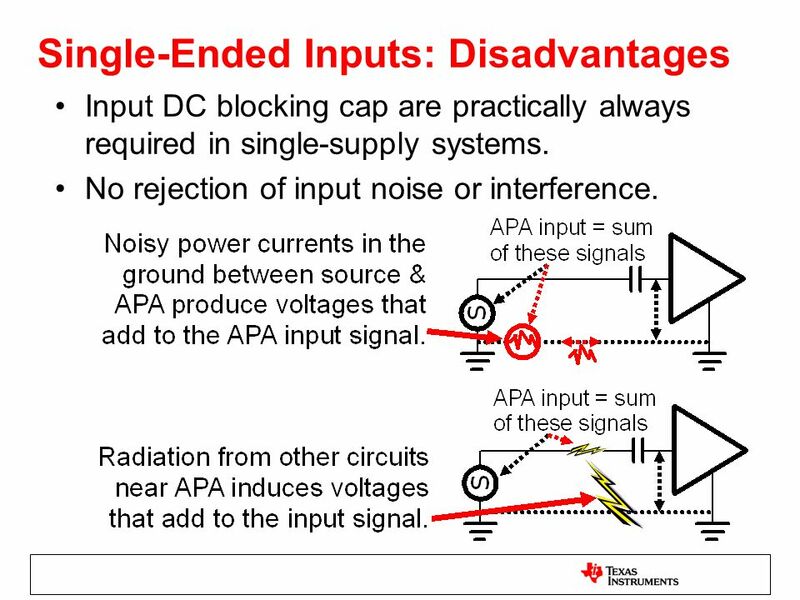 DC blocking capacitor is not required. 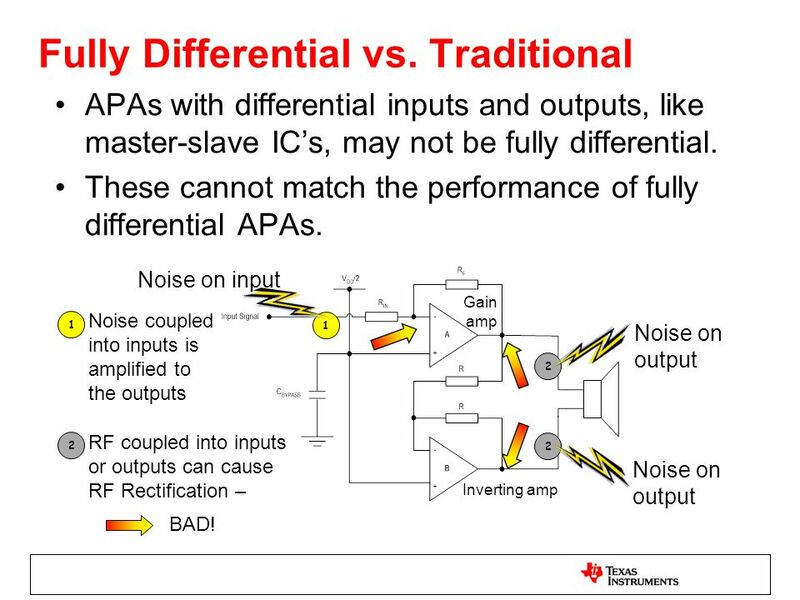 Fully differential APAs use differential circuits at inputs, outputs and all intermediate stages. They have all the advantages of differential inputs and outputs, with increased CMRR, PSRR and RF immunity from balanced differential operation throughout the IC. 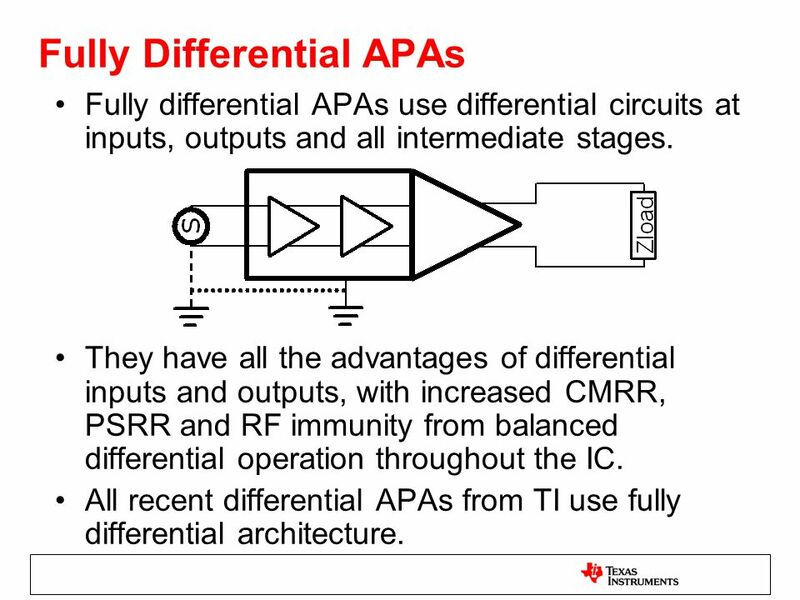 All recent differential APAs from TI use fully differential architecture. 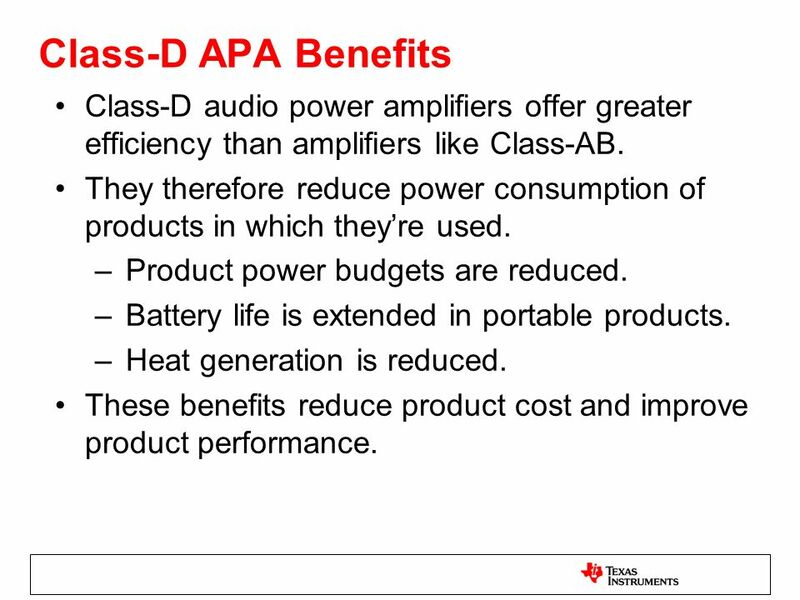 18 Class-D APA Benefits Class-D audio power amplifiers offer greater efficiency than amplifiers like Class-AB. They therefore reduce power consumption of products in which they’re used. Product power budgets are reduced. Battery life is extended in portable products. Heat generation is reduced. These benefits reduce product cost and improve product performance. 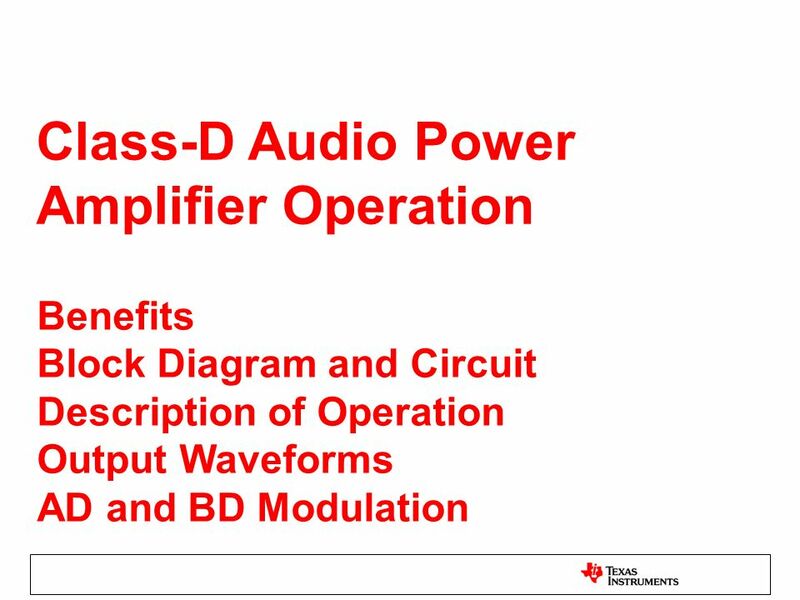 Below is a block diagram for a fully differential Class-D audio power amplifier. 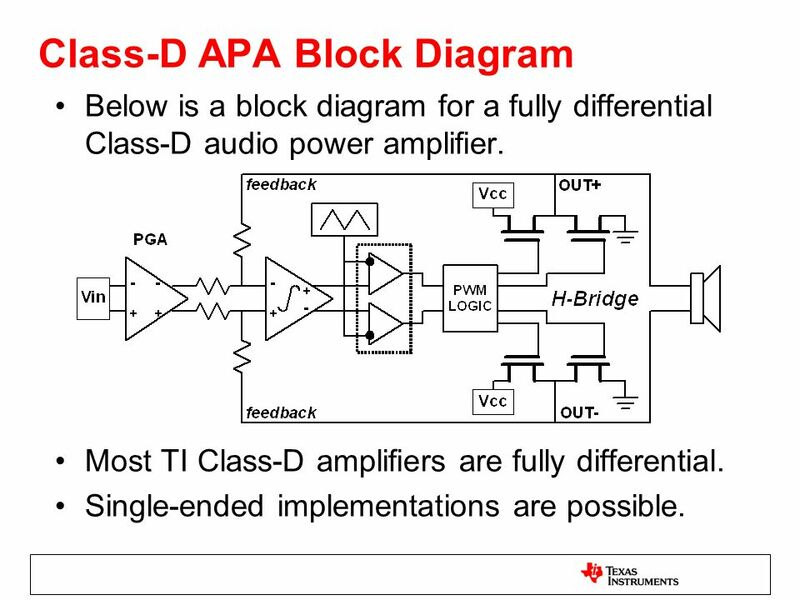 Most TI Class-D amplifiers are fully differential. Single-ended implementations are possible. A programmable-gain differential amplifier feeds a differential integrator and comparator. The integrator takes feedback from the output pulse train, subtracts it from the input signal and low-pass filters the result. 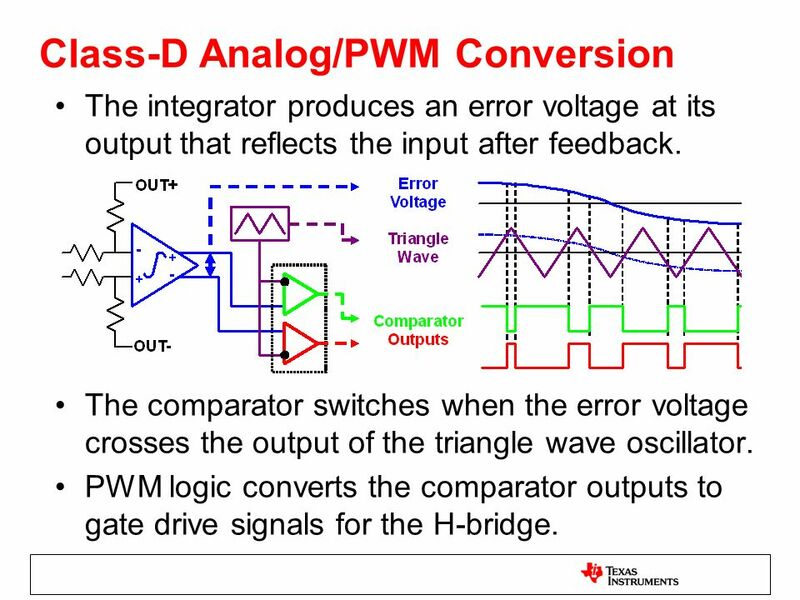 The comparator compares integrator output to a triangle wave to set output pulse width. PWM (pulse width modulation) interface logic drives output FET gates. A MOSFET bridge supplies switching pulses to a loudspeaker, which low-pass filters them to produce an audio output. The integrator produces an error voltage at its output that reflects the input after feedback. The comparator switches when the error voltage crosses the output of the triangle wave oscillator. PWM logic converts the comparator outputs to gate drive signals for the H-bridge. The PWM output switches at a frequency well above the audio frequency range. Its short-term average is the audio-band output. 23 AD Modulation AD modulation, the simplest technique, puts the full differential output voltage across the load at all times, varying the duty cycle to control output. (Differential or BTL AD modulation is shown on the preceding page. 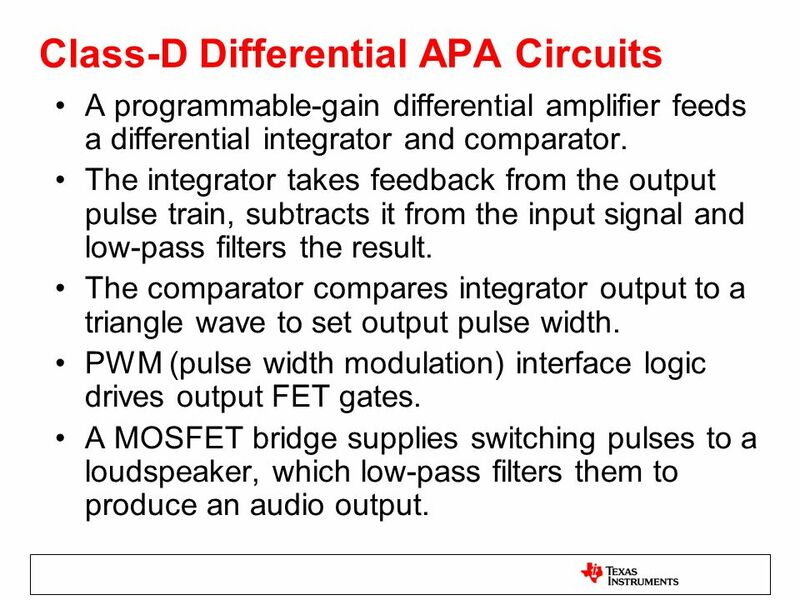 In differential AD modulation the outputs are always switched in opposite phase.) 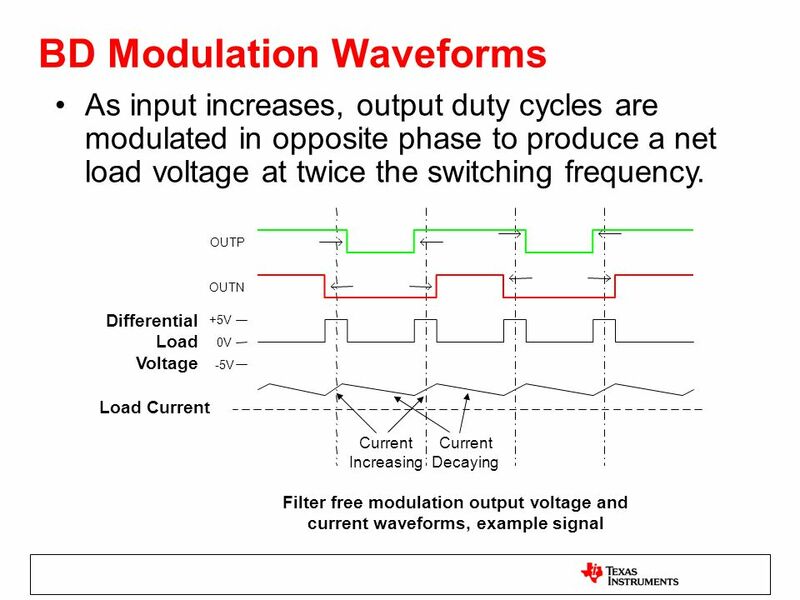 AD modulation is a powerful technique, but it can generate high ripple current in the load at the switching frequency. 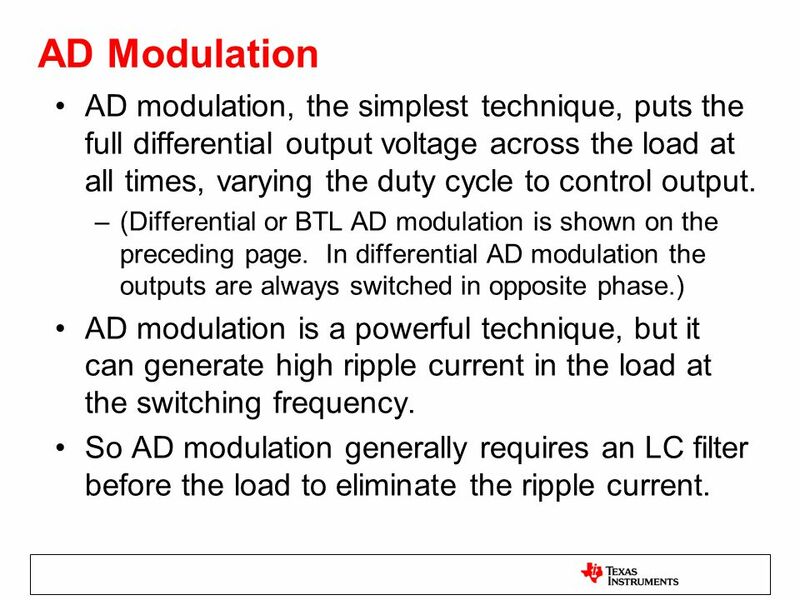 So AD modulation generally requires an LC filter before the load to eliminate the ripple current. 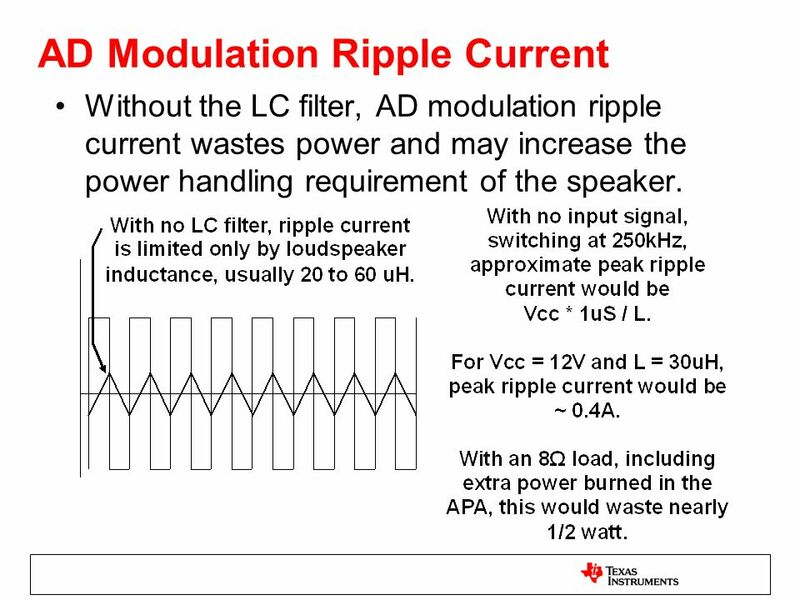 Without the LC filter, AD modulation ripple current wastes power and may increase the power handling requirement of the speaker. A newer technique, BD modulation, permits operation without an output LC filter. 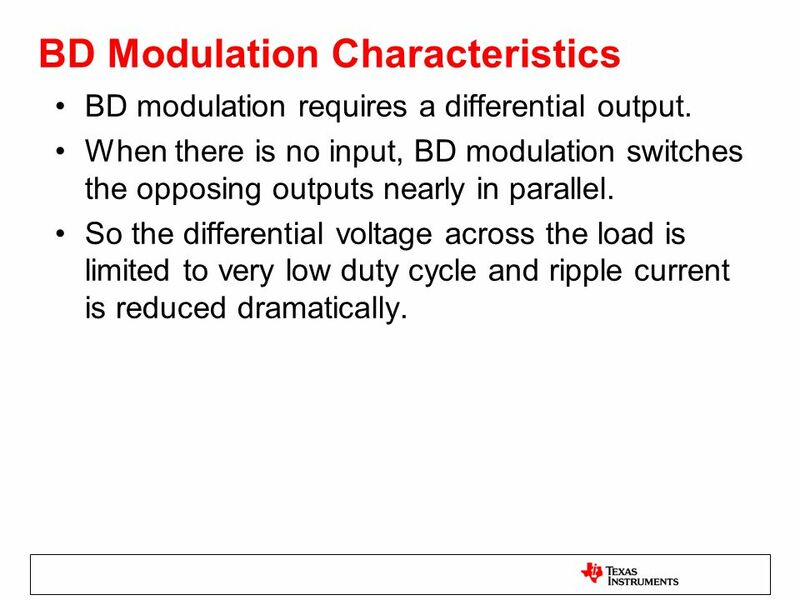 BD modulation requires a differential output. When there is no input, BD modulation switches the opposing outputs nearly in parallel. 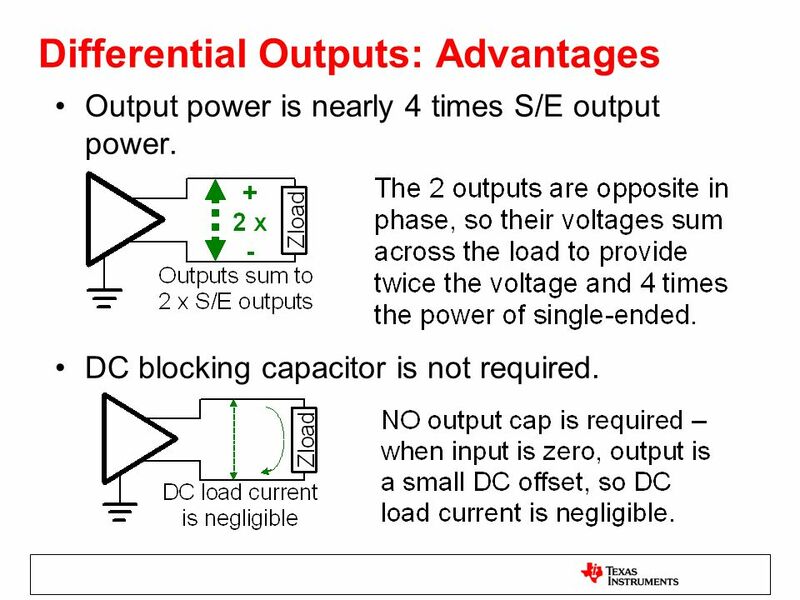 So the differential voltage across the load is limited to very low duty cycle and ripple current is reduced dramatically. 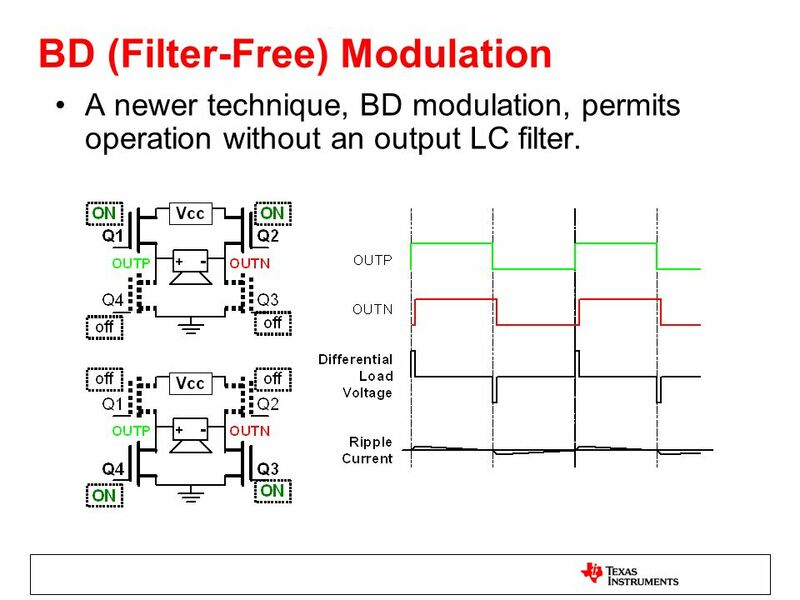 BD modulation eliminates the problem of ripple current without an output LC filter. 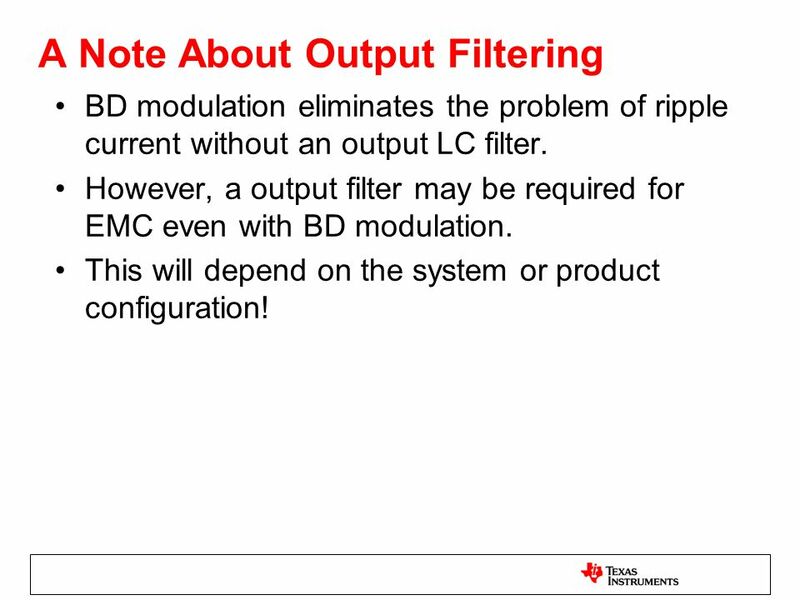 However, a output filter may be required for EMC even with BD modulation. This will depend on the system or product configuration! Look again at an earlier graph of Class-D output. The switching waveform doesn’t look much like the audio output. 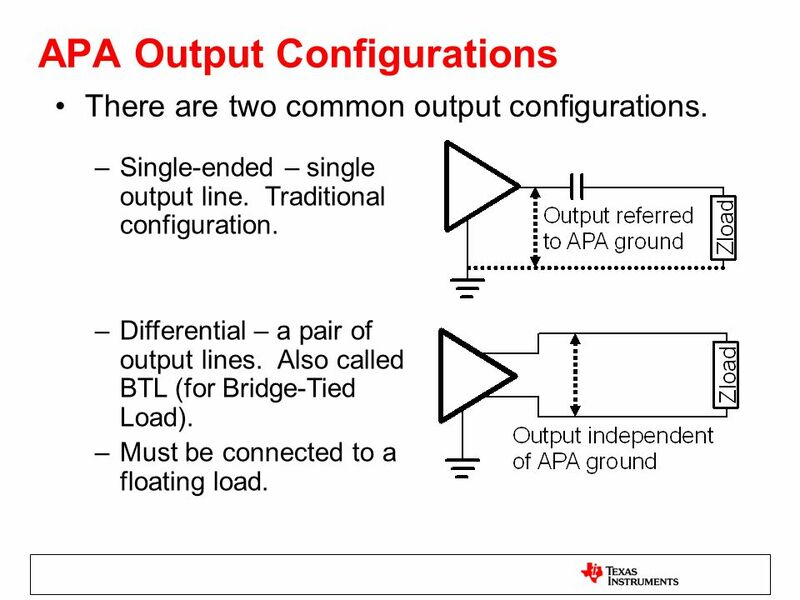 Single-ended outputs are measured between output and ground. HOWEVER ! – measure differential outputs BETWEEN the 2 output lines to be accurate. Do not connect probe ground to a differential output – that will short it to ground. Measure single-ended outputs to ground. 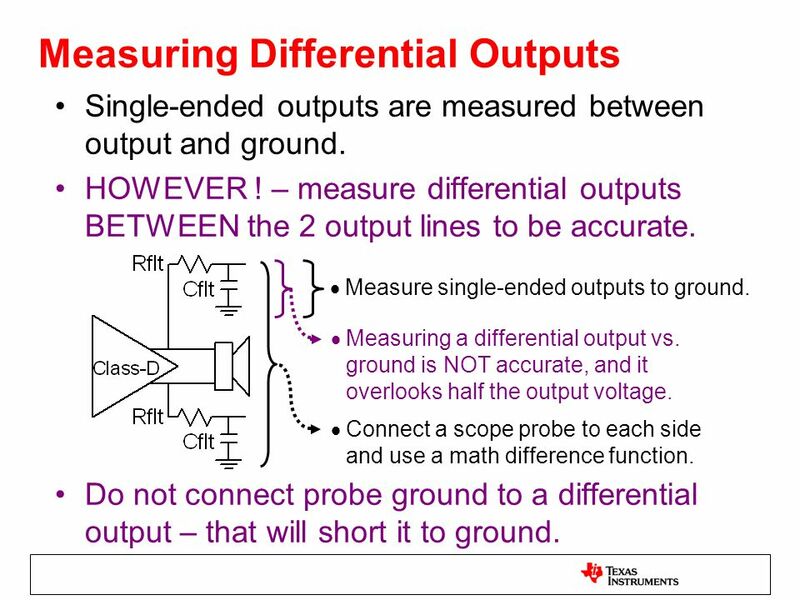 Measuring a differential output vs. ground is NOT accurate, and it overlooks half the output voltage. Connect a scope probe to each side and use a math difference function. 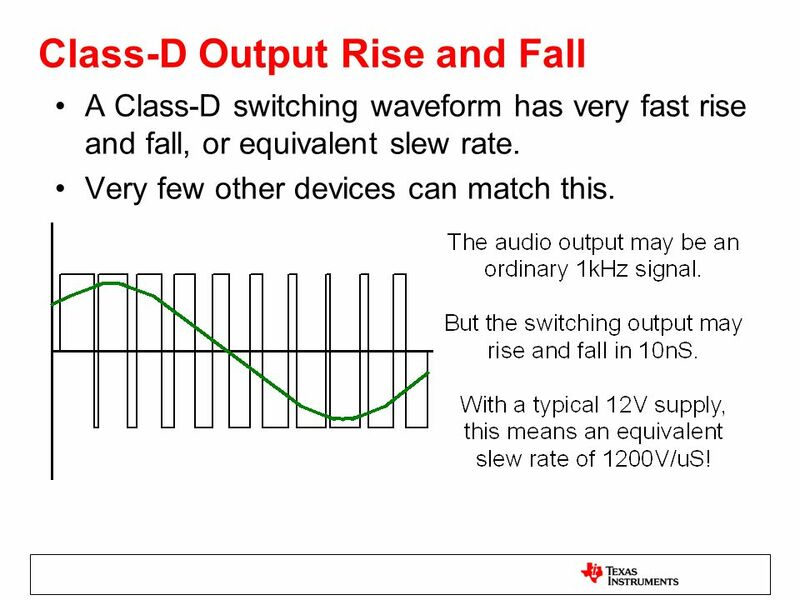 A Class-D switching waveform has very fast rise and fall, or equivalent slew rate. Very few other devices can match this. 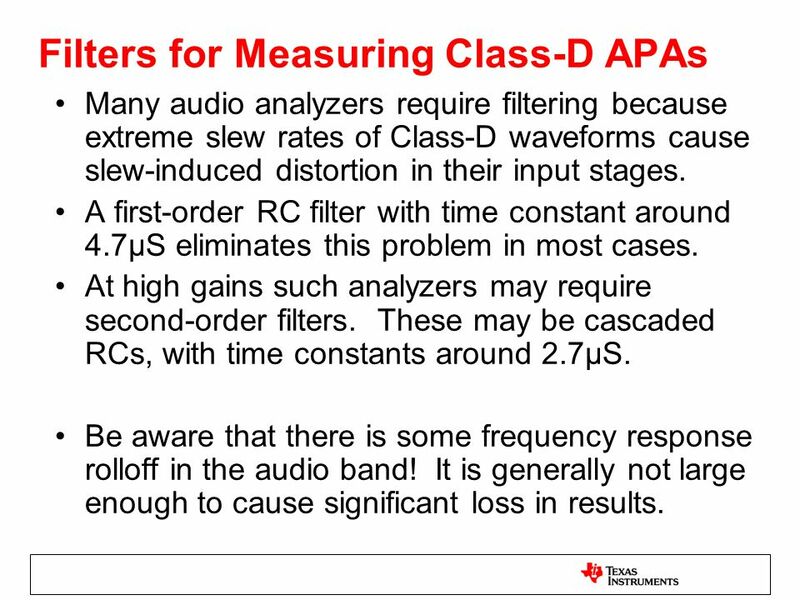 Many audio analyzers require filtering because extreme slew rates of Class-D waveforms cause slew-induced distortion in their input stages. 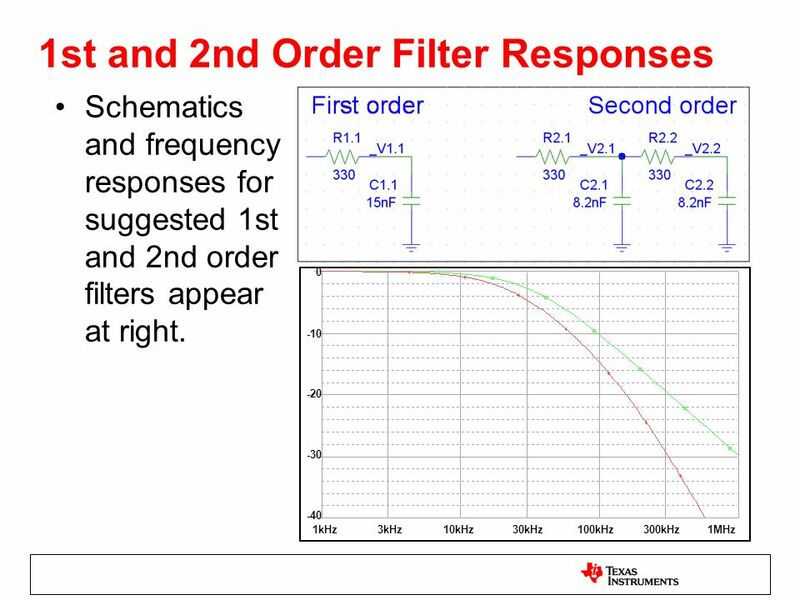 A first-order RC filter with time constant around 4.7μS eliminates this problem in most cases. At high gains such analyzers may require second-order filters. These may be cascaded RCs, with time constants around 2.7μS. Be aware that there is some frequency response rolloff in the audio band! It is generally not large enough to cause significant loss in results. 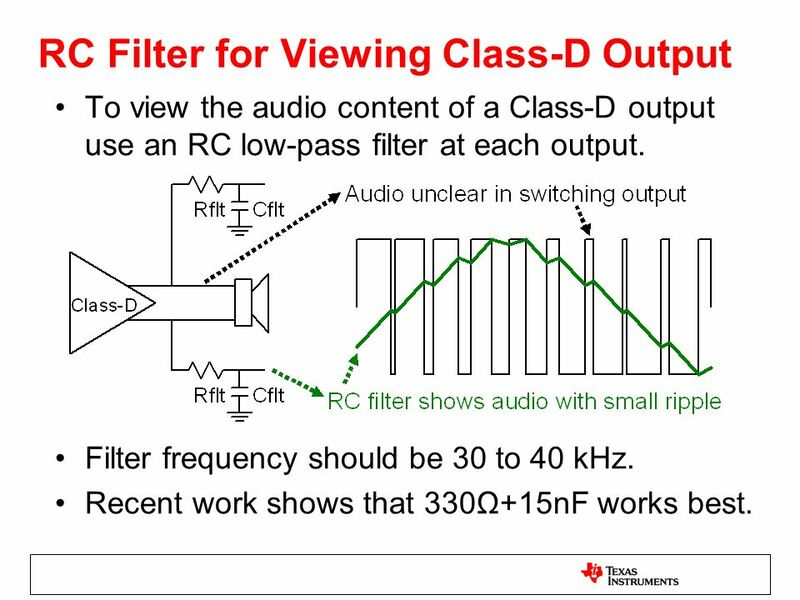 It’s possible active filters could be used for measuring outputs of Class-D amplifiers. 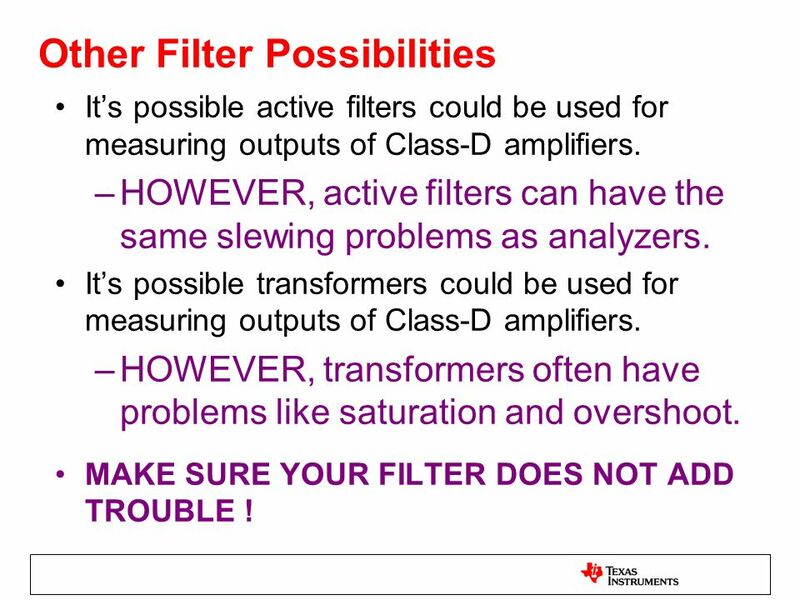 HOWEVER, active filters can have the same slewing problems as analyzers. 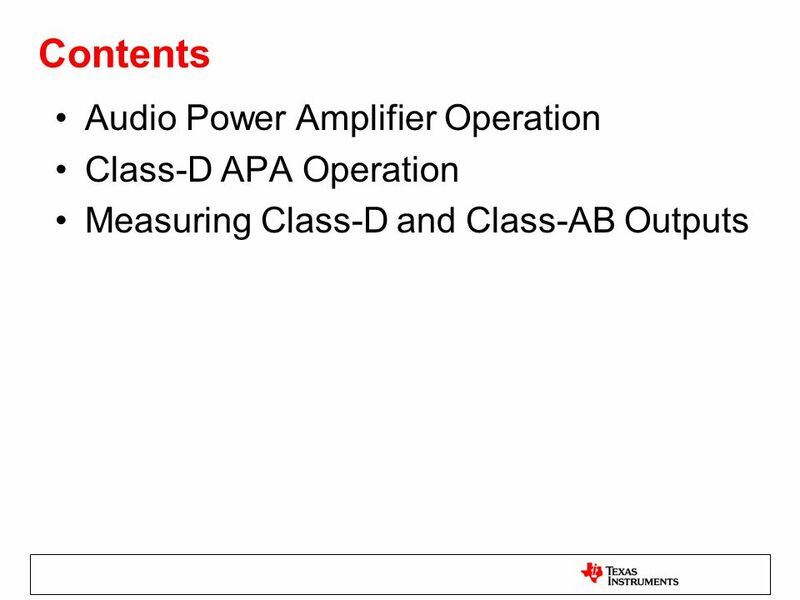 It’s possible transformers could be used for measuring outputs of Class-D amplifiers. HOWEVER, transformers often have problems like saturation and overshoot. MAKE SURE YOUR FILTER DOES NOT ADD TROUBLE ! 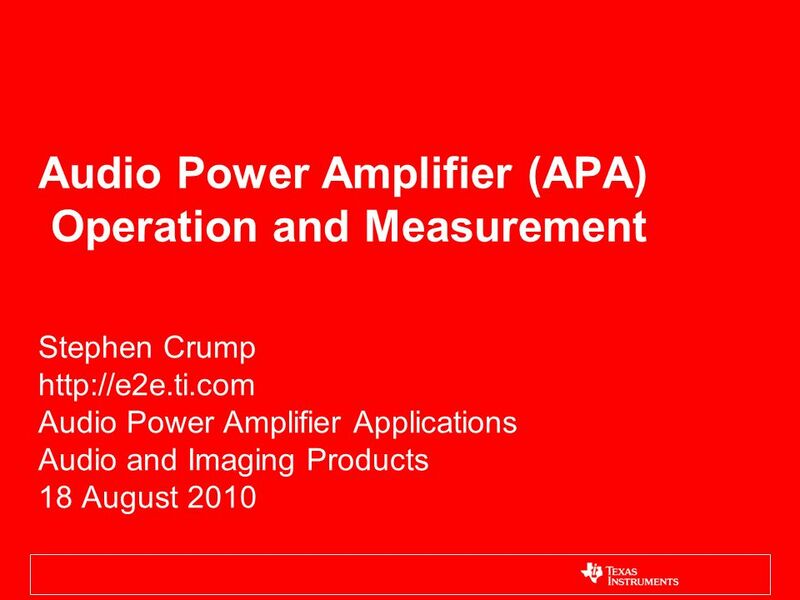 Download ppt "Audio Power Amplifier (APA) Operation and Measurement"
Power e Lab PowerELab Limitedwww.powerelab.com 1 An Active EMI reduction IC WT6001 POWERELAB LIMITED A Power Converter Technology Provider. 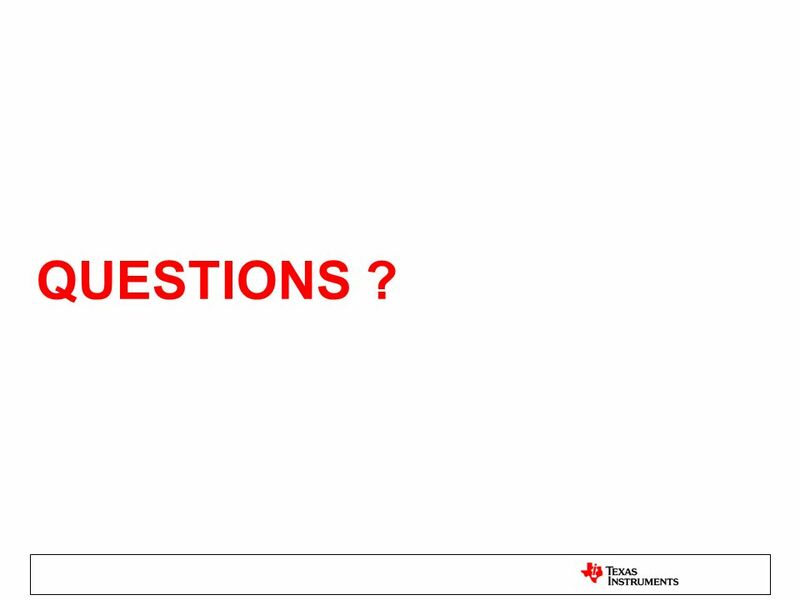 Announcements Troubles with Assignments… –Assignments are 20% of the final grade –Exam questions very similar (30%) Deadline extended to 5pm Fridays, if. Output Stages and Power Amplifiers Output stage delivers the output signal to the load without loss of gain due to Low output resistance D.S.P. Filter. Class AB - Protection A short circuit output causes the current demand to rise beyond the design limit. In practice, it rises just far enough to destroy. 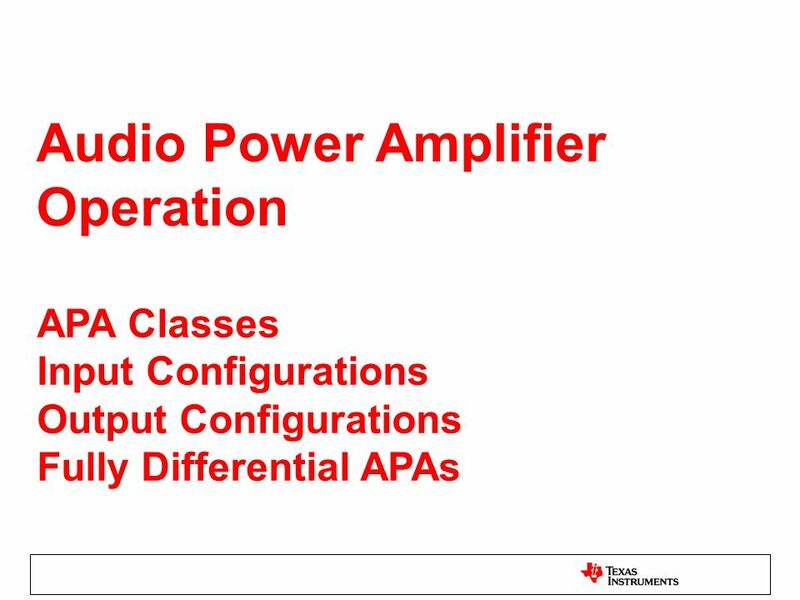 RF Power Amplifiers1 מגיש: יניב מרוז. RF Power Amplifiers2 Introduction  With the explosive growth of RF portable devices and their increasing functional. © 2012 Pearson Education. Upper Saddle River, NJ, All rights reserved. Electronic Devices, 9th edition Thomas L. Floyd Electronic Devices Ninth.